More than any other scholar, Eric Foner has influenced our understanding of America's history. Now, making brilliant use of extraordinary evidence, the Pulitzer Prize winning historian once again reconfigures the national saga of American slavery and freedom. A deeply entrenched institution, slavery lived on legally and commercially even in the northern states that had abolished it after the American Revolution. Slaves could be found in the streets of New York well after abolition, traveling with owners doing business with the city's major banks, merchants, and manufacturers. New York was also home to the North s largest free black community, making it a magnet for fugitive slaves seeking refuge. Slave catchers and gangs of kidnappers roamed the city, seizing free blacks, often children, and sending them south to slavery. To protect fugitives and fight kidnappings, the city's free blacks worked with white abolitionists to organize the New York Vigilance Committee in 1835. In the 1840s vigilance committees proliferated throughout the North and began collaborating to dispatch fugitive slaves from the upper South, Washington, and Baltimore, through Philadelphia and New York, to Albany, Syracuse, and Canada. These networks of antislavery resistance, centered on New York City, became known as the underground railroad. Forced to operate in secrecy by hostile laws, courts, and politicians, the city s underground-railroad agents helped more than 3,000 fugitive slaves reach freedom between 1830 and 1860. Until now, their stories have remained largely unknown, their significance little understood. 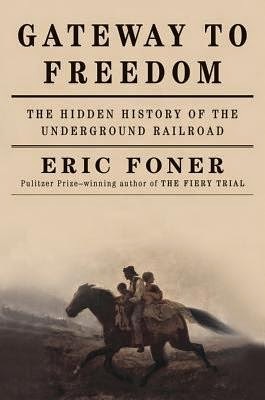 I read Gateway to Freedom/ The Hidden History Of The Underground Railroad by Eric Foner. This book is very enlightening on the subject of slavery in the United States and the importance of the underground railroad in the northern United States from its inception up to, during, and beyond the civil war. It is very scholastically written with attention to historical detail both widely known and newly surfaced material. Every aspect of the characters portrayed are all at once brave, inspiring, and humbling. The author goes into such detail that I felt as though I had met both the fugitive slaves as well as the abolitionists. Mr. Foner was able to weave fact and his personal interpretations of not so widely accepted resources into a very believable historical representation. He tells the story in a chronicled style that was easy to follow and understand. With access to all of the resources he utilized. I highly recommend this book to anyone that loves history and are open to new suggestions of the way history actually happened.